What does this name Lhundrup Choeling mean, anyway? Well, I’ll get to that. It was a lovely afternoon. I had spent the morning with Aryan at the Pentagon College with the social work students talking about recycling and climate science and the climate issues Nepal is likely to be (or already) dealing with. It was a hit. But I was home now with the afternoon free. I had been eyeing these mountains surrounding the valley and wondering how to get up there. There are trails, but there are few roads. I did a little research on the Shivapuri National Park and read a couple guide book entries about Nagi Gompa, yet another temple way up on a hill. 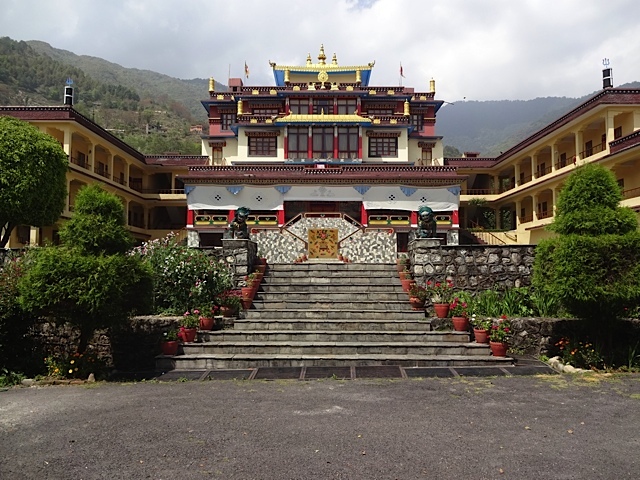 It may be small, but its history is that it was built by Tulku Urgyen RInpoche–Tsoknyi’s father– in the 60’s, and is now a nunnery. It may not be getting as much love as the Big Boys in town, but its appeal would be the spectacular views. I wasn’t quite expecting to see the Himalayas, you understand. Just a better vantage point on the valley. My instincts about the route were better today. I did not get lost. 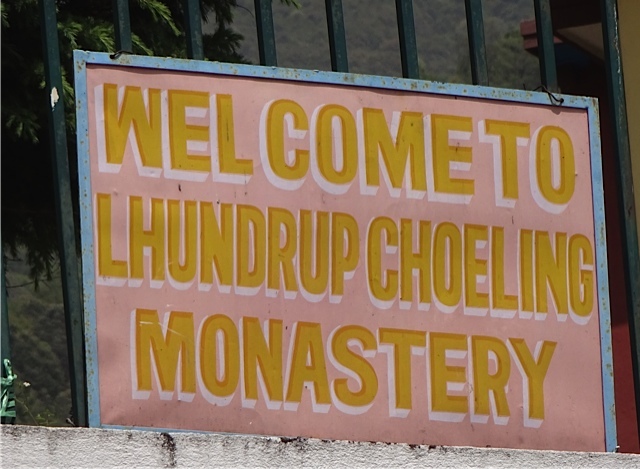 But as I climbed straight up this hill, the road becoming ever steeper, I saw a sign saying “Lhundrup Choeling Monastery.” I stopped in my tracks. Well okay, maybe not. 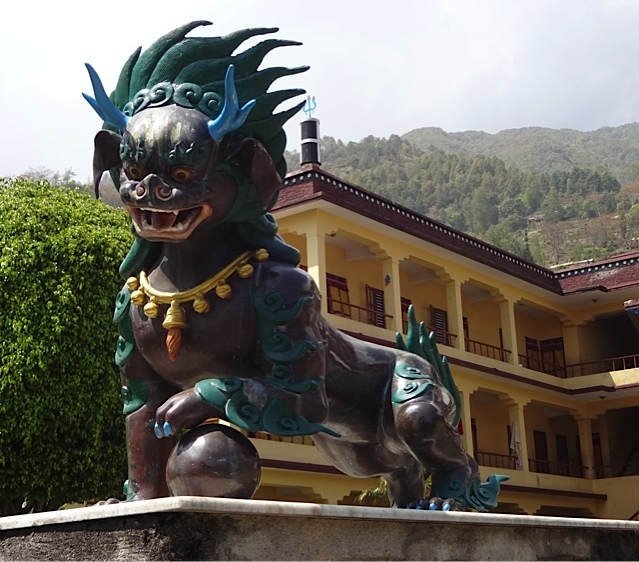 But when I named the blog, I knew the Tibetan word for what I was calling it. 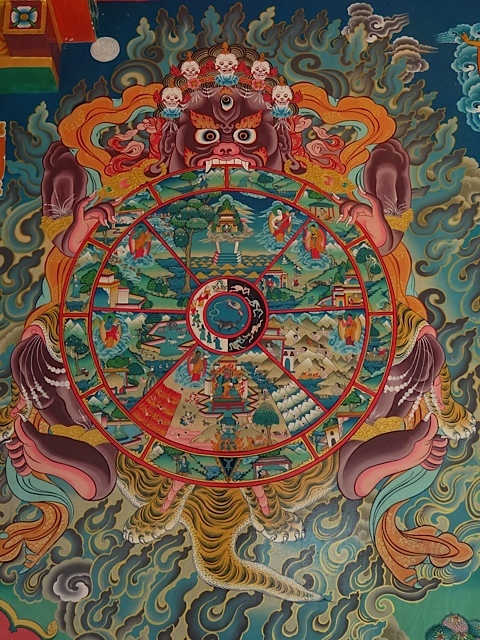 It refers to the spontaneous arising of what is known in Tibetan texts, particularly in the writings of 13th century Tibetan Jedi master, Longchenpa, as “basic space,” aka the source of everything. I had to visit. The gate was closed. I hung around. I took a couple photos. Then the gate opened. A guard motioned me in. I was thrilled. I figured it was old and small. I was right. None of the grandeur or opulence of the White Gompa or Kapan Gompa. Nothing special here, just your basic “barely getting by” kind of monastery ‘space’ with accommodations for maybe 50 monks, max. As I crept up the steps to the sanctuary, I saw all the shoes at the door. I heard prayers being recited inside. Many of the shoes were small. There were young monks here. I hung around outside the open door that was draped with a billowing fabric. I listened. A monk appeared. He motioned to me that it was OK for me to go inside. I held up my camera as if to ask if it was OK to take photos. He said yes. 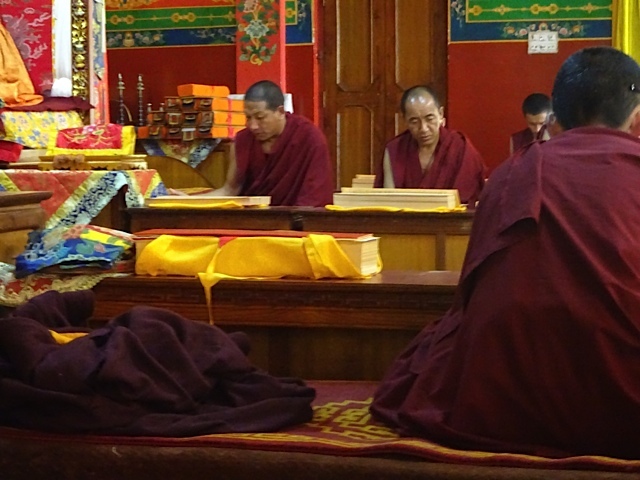 When I stepped inside, there were two ranks of monks seated at their usual low tables. The inner rank were older men, the outer rank were teens. There were a few other tables further yet, occupied by young boys. Maybe 25 in all. All were reciting. The looked at me. A couple of the older monks nodded a simple welcome. I moved to the side and sat at a table where there were several open seats. The recitation continued without skipping a beat. But they were not synchronized. Far from it. Everyone was reciting the same text, but in their own way. The effect was like riding on an ocean of sound, small waves rising and falling among the larger ones. Sound rising and falling asynchronously, at differing volumes and pace, some syllables emphasized, some seemingly dropped. Each monk a chant-wave, appearing and disappearing moment to moment; some monotonous, alternately lifting themselves briefly up and over the others, sinking back down to a more solitary presence, taking breaks, drinking water, turning pages, organizing their texts. And just when you think silence might happen, the flow is rescued by yet another voice rising emphatically. Two young boys got up and left the room. Five minutes later they reappeared, each carrying two-liter bottles of Coca-Cola and Sprite. 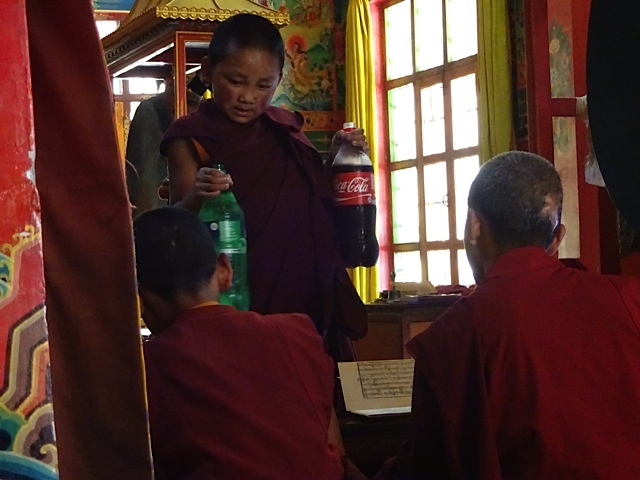 They made the rounds to each table while the recitation continued, offering each monk Coke…..or Sprite. They poured. Suddenly one of the boys appeared in front of me and put down a glass. Another came by and offered me Coke…or Sprite. I chose Coke. I drank. It was cold, colder than any so-called cold drink I’ve had here. It was good. The recitation continued. Shortly, I rose and edged my way out, bowing in gratitude as I left. Outside, I saw the monk who had motioned me inside. I approached him and asked him to translate the name of the gompa. Choe means dharma and ling is a place of learning. He started to describe lhundrup, but he couldn’t quite express in english what he was trying to say. It’s just as well. The meaning of lhundrup is inexpressible anyway. Or at least resists translation. No doubt about it. This guy is fierce! He asked me what I was doing in Nepal. I told him. I mentioned Tsoknyi Gechak School. I showed him my blog. He asked me what I was studying. I mentioned Longchenpa, the teacher of teachers. 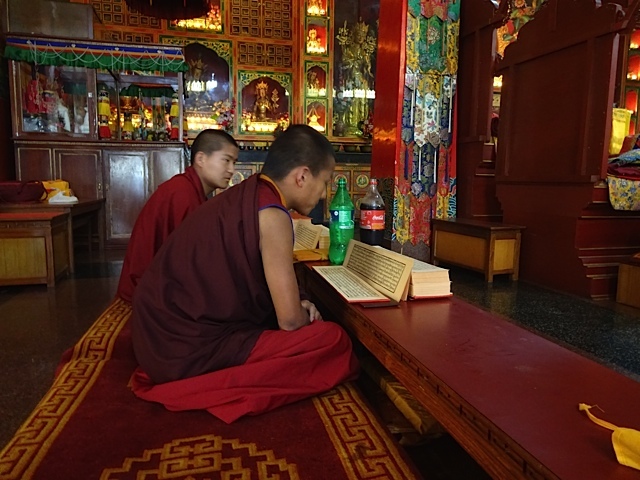 He tells me he has a tanka of Longchenpa and asks if I would like it. I gasp. (Is he serious? Is he going to just give me a tanka?) He says he has an extra and runs off to get it. 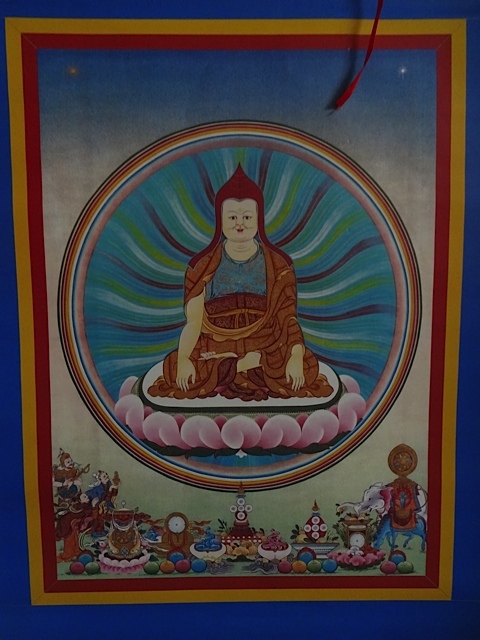 He returns with a paper tanka all rolled up, saying it was painted by a lama in India and given to the incarnate teacher of this gompa, who reproduced it for the monks. 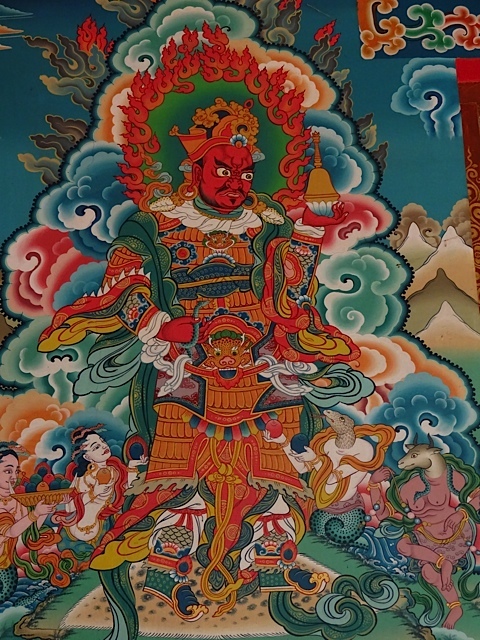 It’s very nicely done and it sure looks like every other representation of Longchenpa I’ve seen. Just like that. It’s in my hands. This sutra’s so bright, I gotta wear shades! I did finally make it to Nagi Gompa after paying 600NRs at the gate of the Shivapuri National Park and pulling 5 km up a teeth-chattering deeply-rutted and stony so-called road. It was a little anticlimactic because it was now so late in the afternoon that the rain clouds were gathering and the valley was foggy. And sure enough, just as I was leaving, it started raining. By the time I donned my poncho and headed down the hill again, the rain had turned to hail. The road was now much worse wet. I nearly spilled the bike more than once and was pretty much soaked by the time I got down the hill. But I didn’t care. I had a tanka of Longchenpa in my pack that came from Lhundrup Choeling Monastery. p.s. I realize that for some this material may be getting repetitive. Visiting all these religious sites. But for one thing, if you come to Nepal and aren’t prepared for a religious experience, what are you doing here? And for another, some posts just write themselves. Like Fish Spa, you just can’t make this stuff up. This entry was posted in Buddhism, Nepal, Personal, Travel and tagged Buddhist ritual, Kathmandu Valley sites, Lhundrup Choeling, longchenpa, Nagi Gompa, Nepal, Nepal monasteries, Shivapuri National Park, tanka, Tsoknyi Rinpoche, Tulku Urgyen Rinpoche by garyhorvitz. Bookmark the permalink.